Our summertime lunches have alternated between pasta, sandwiches, and assorted kinds of pancakes. Making pancakes for lunch takes hardly any more time than cooking pasta. And we are big fans of pancakes with a side of bacon or sausage. It runs in the family I suppose, since pancakes were what my grandmother was making nearly every day for lunch or dinner before she had to stop cooking altogether. It’s a tradition worth carrying on, in my view, and my children concur. 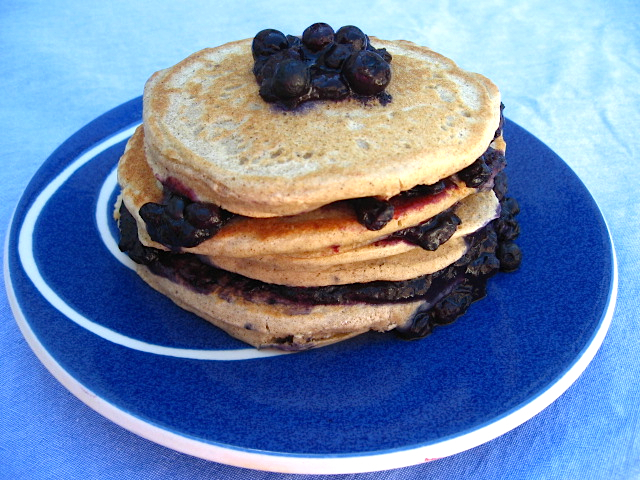 We also recently enjoyed our stacks of Honey Oat Bran Spelt Pancakes. Though we now live in the wheat belt of Canada, sometimes a reprieve from gluten does a body good. So for this version, I broke away from tradition and used buckwheat, which is rich in minerals like magnesium and manganese (source). I’ve taken to buying light buckwheat flour, but I would like to try regular buckwheat flour next time and see how the two versions compare. To make pancake batter, combine dry ingredients and stir with a fork. In a separate bowl, beat eggs, coconut milk, orange juice, and oil (or butter). Stir together wet and dry mixtures until just combined, but without any dry lumps. Pour batter onto a lightly greased preheated skillet and flip when bubbles form in the middle and edges are set. Cook the second side until a deep golden appears. Cover pancakes to keep warm. Meanwhile, for the sauce, mash together berries, peaches, and cornstarch in a small to medium saucepan. Add sugar (or honey) and lemon (or orange) juice. Heat over medium low heat, stirring constantly. To serve, butter and stack pancakes and pour fruit sauce over them. Garnish with additional berries or peach slices if desired. I’m sharing this recipe at Allergy Free Wednesdays, Gluten Free Fridays and Create & Inspire. What a gorgeous stack of pancakes! Love the sound of that sauce! Delectable. I’ve been on the lookout for a gluten-free pancake recipe! Thank you!